Pra Kru Wat Ling Khob ancient hiding place amulet, an all time classic that has become extremely sought after and preferred in recent years, as the legend of its connection with Somdej Dto of Wat rakang became common knowledge. The Pra Gleep Bua Wat Ling Khob is an ancient Pra Kru amulet that was made or blessed in 2410 BE, and then removed from its hiding place in 2509 BE, that has become a Pra Niyom preferred class Pra Kru amulet of immense sacred value. The Pra Gleepo Bua amulet is known by common folk as the 'Pra Kru Wat Ling Khob'. 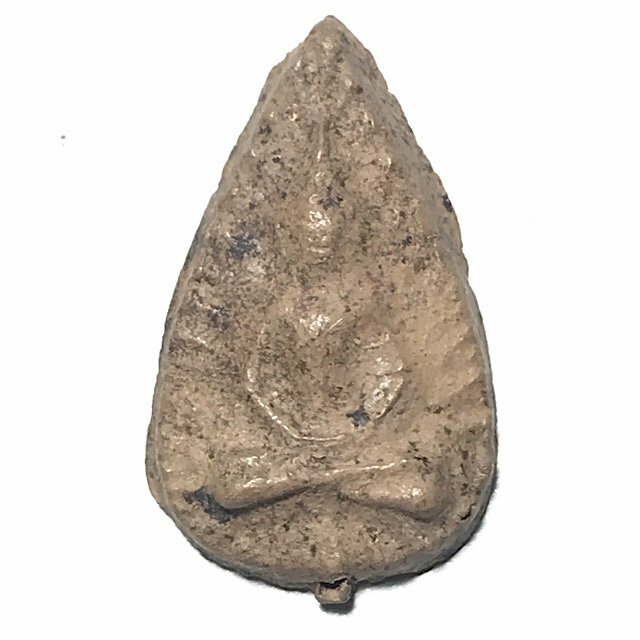 The Pra Gleep Bua amulet varies slightly from each to each in size because of the hand pressed nature of their makiing, but on average measure around 2.9 Cm high and 1.8 to 1.9 Cm wide. The Buddha image is in the 'Samati Paetch' posture (full lotus) with both palms upwards turned on the lap. The head is ovaloid (egg shaped), and the Molee / Pragaes topknot is double tiered (two levels). The Buddha is not seated on any kind of throne or dais, but has a 'Rasamee' Aura around the Buddha, radiating light. The details of the Buddha and his robes are still noticeable despite the age of the amulet, and is part of the reason for the immense popularity of the amulet, for it is truly an ancient amulet of subtle beauty. The belief that the amulet was a creation of, and blessed by the great Somdej Pra Puttajarn (Dto) Prohmrangsri of Wat Rakang Kositaram, is of course a game-changer in what has made the Pra Kru Wat Ling Khob the world famous and popular preferred amulet it has become, since its discovery until the present day. The rear face of the Pra Kru Wat Ling Khob Pim Gleep Bua, is almost always indented with a concave surface, from the thumb of the person pressing the amulet. However, there are the odd examples with flat rear faces too, from cases where the amulet stuck inside the block press mold and an instrument was used to prise it our. Flat rear faces are however seldom to find, and less preferred. The amulets in general will have some blackish growth or residue on small areas of the surface. Some exhibits may have silvery or golden powdery residue.The clay can be of a number of different tones and colours, due to the old fashioned furnaces having unstable heat containment, and so different batches would bake at differing temperatures, producing different coloured tones of clay. 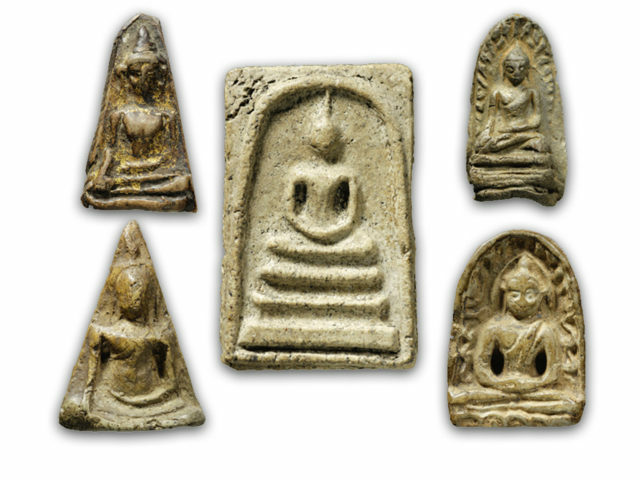 This effect is often seen in many other famous Pra Kru amulets of baked clay variety, such as the Pra Kong Lampun of Gampaeng Paetch and Supanburi. The Pra Gleep Bua Kru Wat Ling Khob were distributed in 2509 at a price of 50 baht each or so, and a total of 300,000 Baht was raised for the temple fund (a lot of money in that time). The money was used to build a Sala Bprian Dhamma study hall, which still stands within the temple enclave to this day. Wat Ling Khob is the common Folk name for the royal temple of Wat Bovorn Mongkol, which is a temple of 'Chan Dtri third level status, and is a 'Pra Racha Wiharn' Royal Vihara shrine. It resides on the banks of the Chao Praya river, on the Thonburi side of the river. In the time of His Majesty Pra Putta Lerd Fa Nopalay (Rama 2) of the Chakri Dynasty in the Ratanakosin Era, many Mong Tribe people fled as refugees to live under the protective shade of the Kingdom's capital, of which many of these Mong refugees were Monks. Wat Boworn Mongkol (Wat Ling Khob), is to this day still a temple of the Raman ('Raman' meaning Mong Ethnic). The abbots of the temple were all Raman (Mong people), consecutively until the year 2462 BE, when the temple had begun falling into disarray, as society and the changes in how people made their professions caused the Mong ethnic devotees to reduce in numbers, and spread around Bangkok. The temple was then reformed, by being Royally decreed to become a Dhammayut lineage temple (official lineage Buddhism sect of the Thai State), and it has remained such to the present day, with appointed Thai abbots administrating and maintaining the welfare of the temple. To explain the creation of the amulet, one needs to study a little bit about its creator, Luang Por Sri of Wat Chana Songkram; In the time that the third abbot of Wat Boworn Mongkol (Wat Ling Khob), Pra Raman Muni (Luang Por Yim) died, the position of abbot was handed over to Pra Sumetajarn Luang Por Sri of Wat Chana Songkram for a short time until a new abbot was found. Luang Por Sri was a local of Bang Pūd in Nontaburi, who was born in the time of the 3rd Chakri King Rama 3. He ordained at age ten in the year 2378 BE at wat Boromayigawas. He was then however ordained again in 2499 BE in Raman fashion as a Mong Tribe Monk, and resided at Wat Chana Songkram in Banglamphu, Bangkok. He moved after this to to Wat Boworn Mongkol (Wat Ling Khob), because of the death of the abbot, and the lack of anyone to administrate the temple. He took the duty for the year 2410 BE. After this, he returned to be the abbot of Wat Chana Songkram temple, until his passing in the year 2455 BE. During the year of 2410 BE, as Luang Por Sri was presiding over the administration of the temple of Wat Ling Khob, he gathered a number of elder Thera Ajarn master Monks who were Adepts of Puttakom and Saiyawaet Buddha Magic and Occult Sorcery, to bless the amulets, which many people believe to have been made by Somdej Pra Puttajarn (Dto) Prohmrangsri of Wat Rakang Kositaram, as he was still living at the time of this ceremony, and is believe to have also attended the blessing of them. Hence, certain groups of aficionados and devotees of Somdej Pra Puttajarn (Dto) Prohmrangsri Wat Rakang Kositaram collect and revere the Pra Pim Gleep Bua Wat Ling Khob amulet as part of the official pantheon of Somdej Pra Puttajarn Dto. in the month of March in the year 2509 BE, thieves broke into the Chedi Stupa of Wat Ling Khob, and stole a large Bucha statues and amulets from the Kru Hiding Place Chamber within the Chedi. The temple informed the Police as soon as they became aware of the break in, but in the following time, thieves continued to sneak in and steal amulets from within the Kru. The temple thus informed the Ministry of Buddhism, and asked for permission to open the Kru Chamber with official decree. Permission was given on the 25th March 2509, and Kru Chamber was officially opened. There were two separate hiding places to be opened, the first being in the base of the Chedi Stupa, and the other Kru hiding place was in the top of the Bell shaped dome of the Chedi Stupa. 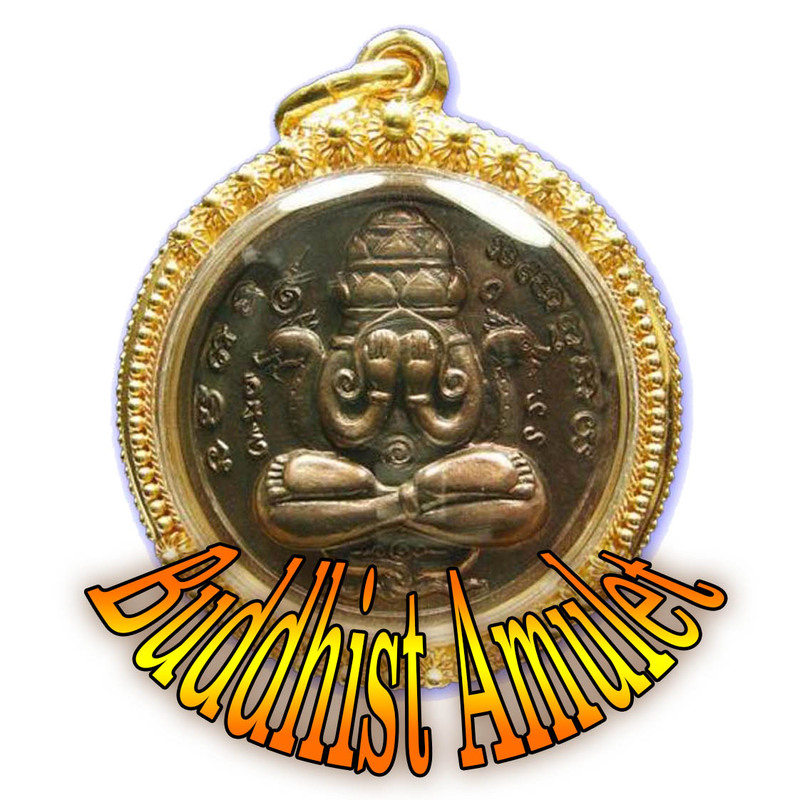 Around 75,000 exhibits were counted in the find, and it is understood that the original number made will almost surely have been the traditional 84,000 amulets according to the 84,000 Dhamma Khanda of the Tripitaka, but that the missing number was the number of amulets distributed when the amulets were first made. or, that these were missing from the thieves who had been stealing them within the Chedi Stupa. The Pra Kru Wat Ling Khob is renowned for Metta Maha Niyom Mercy Charm, and Pongan Khunsai anti black magick protection.